Deborah Sandidge: It's for the Birds! Infrared photography lends itself to all kinds of subjects, including your feathered friends. 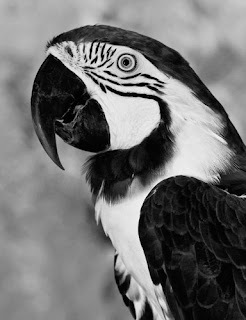 I photographed this parrot with an infrared converted digital SLR camera at Butterfly World in Coconut Creek, Florida. I used fill flash to brighten up the subject and define his feathers. In Photoshop, Nik Silver Efex Pro worked beautifully to convert the image to B&W.